They are fringed all around with hairlike cilia. “It looks like they’re wearing a hula skirt, and they use the skirt to propel themselves,” Moeller said. 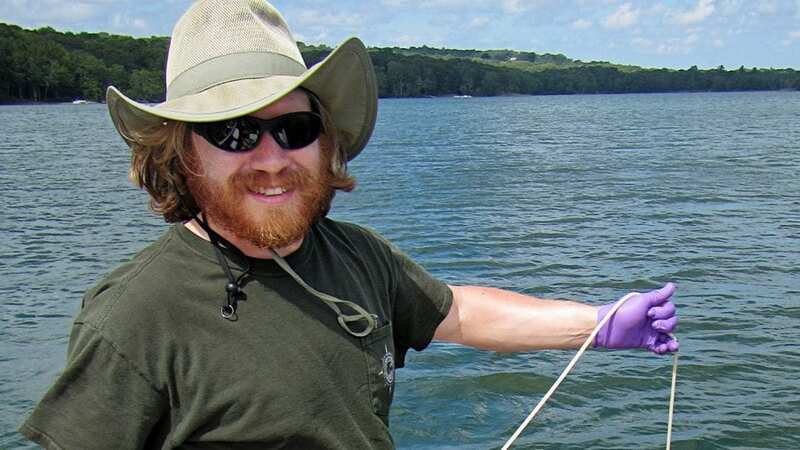 Moeller, a postdoctoral fellow at Woods Hole Oceanographic Institution (WHOI), studies Mesodinium rubrum not just because they are fun to watch. What makes them so special is that, a little like a hybrid car, they can shift energy sources. They are natural predators, obtaining nutrients by consuming plantlike organisms such as phytoplankton and algae that produce their own food via photosynthesis. But M. rubrum can also go “solar-powered”—they temporarily steal their prey’s cellular machinery and start to make their own food. This process, called acquired phototrophy, is a kind of biological takeover: It allows M. rubrum to photosynthesize, getting energy from sunlight while its competitors are stuck relying on catching and eating algae. This unusual ability to “enslave” parts of another organism—or in some cases to enslave an entire organism living inside another—has clear impacts on how food webs and ecosystems operate. It also is probably a key mechanism by which life on Earth evolved. In that article, Stoecker unraveled some of the mysteries of mixotrophs, organisms that can mix the means by which they obtain nutrients. No longer could scientists safely separate organisms into producers and consumers—and that radically changed how they conceived food web dynamics, she said. 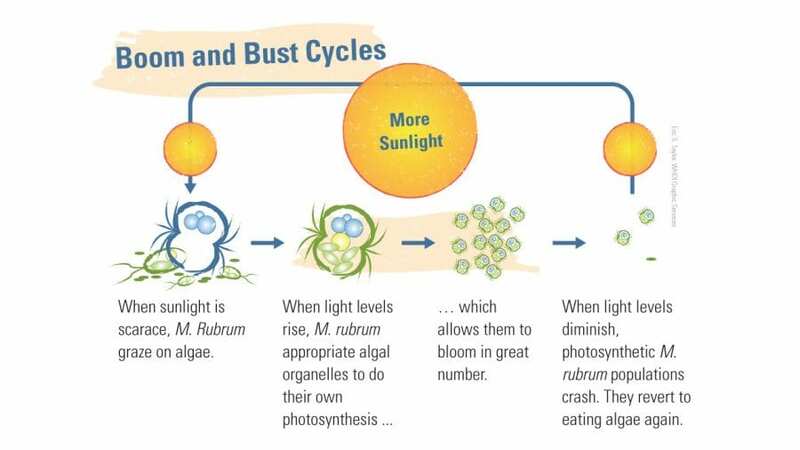 She also alluded to certain species of ciliates such as M. rubrum that eat algae, digesting most of the algal cell components but not the algae’s chloroplasts, the organelles plants use to perform photosynthesis. Instead, they incorporate them for their own photosynthetic use—“a trick that amazes and puzzles both cell biologists and oceanographers,” Stoecker wrote. More than a decade later, after Stoecker moved to the University of Maryland, she passed along a fascination for these organisms to her graduate student, Matt Johnson, who went on to study mixotrophy in its many forms. In 2006, Johnson became a postdoctoral scientist at Rutgers University, where he was introduced to Moeller, an undergraduate at the time looking for a research topic for her honors thesis. Her thesis—on M. rubrum—turned into her first published scientific paper. Moeller graduated in 2008 and moved on to earn a master’s degree in the MIT-WHOI Joint Program, working with WHOI mathematical biologist Michael Neubert on models to analyze the impacts of fishing on marine protected areas. 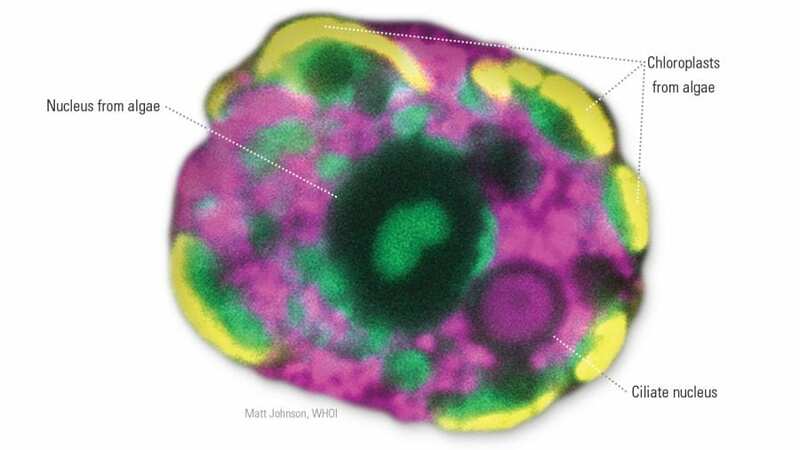 Meanwhile, Johnson joined WHOI in 2009, where he has conducted research on protozoa that steal chloroplasts and other organelles for their own use (a phenomenon known as kleptoplasty) and algae that continue to live inside other organisms (a phenomenon called endosymbiosis). In 2015, after Moeller earned a Ph.D. at Stanford University, she returned to WHOI as a postdoctoral fellow, working with Neubert and Johnson to study the impact of acquired phototrophic organisms on marine ecosystems. “The story passed from Diane to me to Holly,” Johnson said. The endosymbiosis hypothesis was first proposed in the 1960s by biologist Lynn Margulis, who believed that organelles such as chloroplasts and mitochondria, the energy-producing organelles in all eukaryotic organisms, were originally free-living organisms that were conscripted into the bodies of larger cells. Mitochondria have become fully incorporated into their hosts, including humans, but they maintain their own individual DNA to this day. Johnson has used M. rubrum as a model to understand how it rewires its cellular machinery to support foreign organelles, allowing it to photosynthesize without any genetic ability to do so. “No one has any idea how this works, so it’s a real challenge,” Johnson said. Johnson selected M. rubrum as a model organism mainly because it plays such an important ecological role in ocean microbial food webs. Since the 1960s, scientists have been attracted to M. rubrum’s ability to form massive red blooms in the water, something Johnson says was first observed during Darwin’s early 19th-century voyage aboard the HMS Beagle. Johnson discovered that M. rubrum go so far as to also steal nuclei from algae to help them grease the stolen cellular machinery and enhance their own capabilities. The process is similar to kleptoplasty but more advanced. Johnson coined the term “karyoklepty,” a combination of the Greek words for “kernel” and “thief,” to describe this process of nucleus stealing in a paper published in 2007 in the journal Nature. “It’s like stealing the manual for the machinery,” Moeller said. With the algae’s nuclei, phototrophs also acquire the instructions to do such things as make more chloroplasts, synthesize different pigments, and optimize chloroplasts’ ability to perform at different light levels. M. rubrum’s ability to harness the metabolism of another organism continues to fascinate Johnson. It’s an extreme adaptation that’s easy to think is strange. In fact, that’s the kind of reception Johnson and his colleagues have gotten from many members of the scientific community. Even a few multicellular organisms do it. Elysia chlorotica, a sea slug that can be found on Martha’s Vineyard, is bright green from the chloroplasts it steals from the seaweed it consumes. To explore the phenomenon of acquired phototrophy, Moeller, Johnson, Neubert, and Elina Peltomaa, a colleague at the University of Helsinki, took a two-pronged approach. 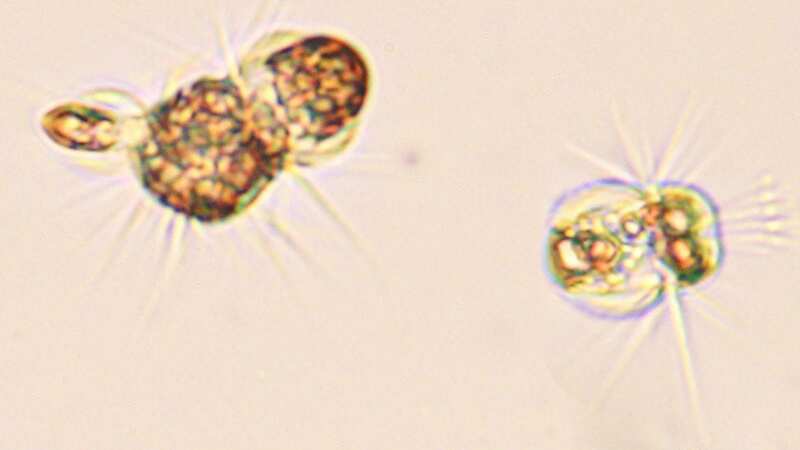 They combined their understanding of acquired phototrophs’ metabolic capabilities with a mathematical model of the impacts that such organisms—with dual roles as both predators and competitors of phytoplankton—would have on the ocean food web. In their study, published in February 2016 in Ecology Letters, the research team showed that acquired phototrophs can have a dramatic impact on the dynamics of marine microbial communities, causing a series of boom-and-bust cycles. 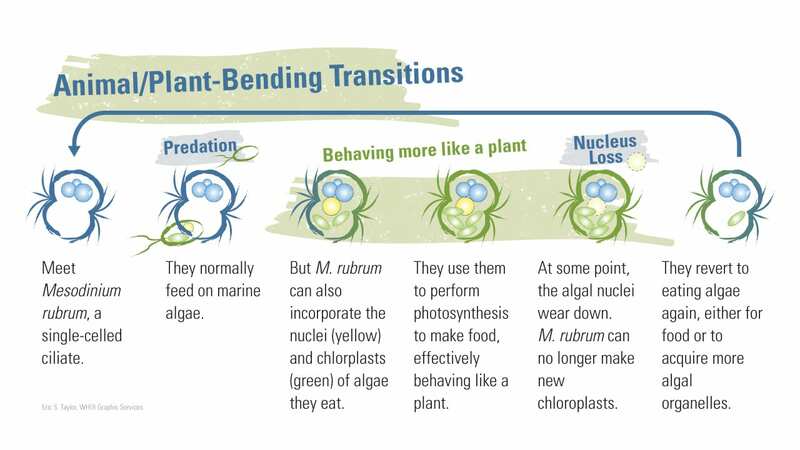 When there’s too little sunlight, acquired phototrophs survive by grazing on algae. But when light levels increase, photosynthesis becomes a better bet, and the acquired phototrophs shift gears. Their ability to steal chloroplasts temporarily makes them not dependent on their prey. 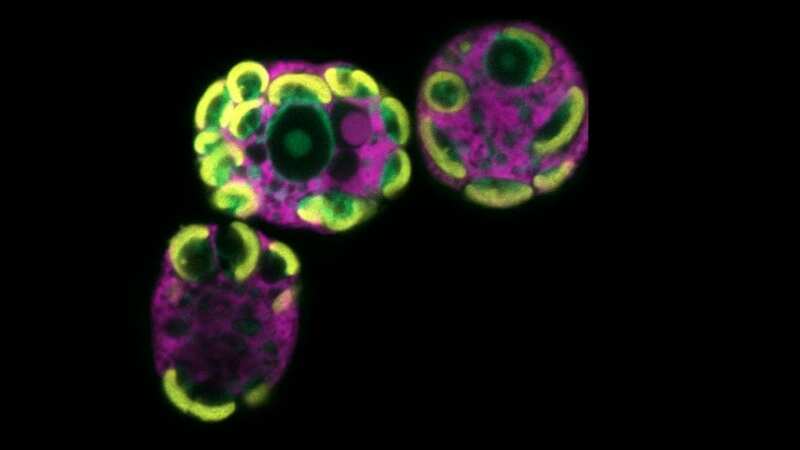 They harness the power of photosynthesis to fuel blooms like those Darwin first observed. When algae populations fall or light levels decrease, the phototroph populations crash. Moeller plans to continue “merging equations and experiments to inform ecological theory.” In July 2017, she will move on to become an assistant professor at the University of California, Santa Barbara—the student transforming into a teacher to launch a fourth generation of scientific inquiry.